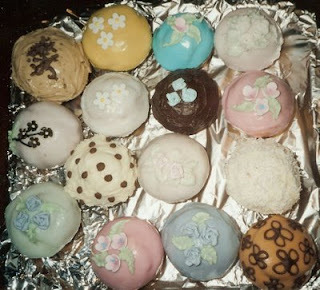 I love making cup cakes and was spending a lot of time making icing flowers to decorate them (see below). 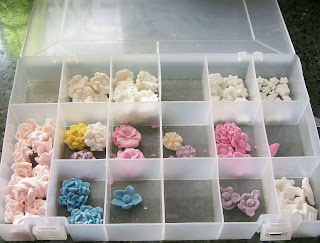 But then I discovered Flower Moulds. 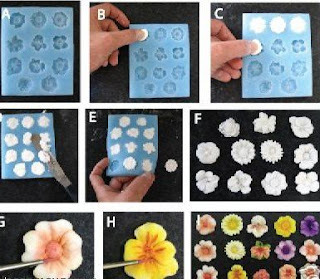 Moulds make the whole flower making process easy!!! You get fantastic and very detailed flowers and the best bit is, anyone can do them. I still make my roses from scratch but for all other flowers I use the moulds. Best of all they are quick and simple to use. You should be able to buy these moulds at any good cake decorating supplies shop or online. I get mine via eBay. (A) To create flowers I used a Small Flower Set Mould. (B) Roll a small amount of icing into a ball and dust with cornflour. Push into the mould. (C) Continue pushing the icing into the mould, making sure you press firmly to capture all details. (D) Using a spatula flat against the mould, in a back and forward motion, cut off the excess icing. You can now put the mould into the freezer for a couple of minutes to firm the icing if your mould has many details or your icing is soft. (E) Flex the mould gently and ease out the flowers. (F) The unmolded flowers are left to dry. Make sure you dust some cornflour underneath to prevent them sticking to your drying surface. (G) Using dusting powders add some colour to the flowers. (H) I dipped the paintbrush in water and then the dusting powder to give a darker colour for the details on the flower. I usually make a bulk supply of flowers and then store them in a plastic container. See, simple!! !